Hmm. The Starbucks Reserve Roastery in Seattle might be a cynical piece of coffee merchandising masquerading as a place where they make and roast overpriced coffee, but we do really like it there. And the coffee is very nice too. Shurey shome mishtake I can hear you thinking. But no. Today we went up to one of my other favourite places in the world, Pike Place Market. And the sun was beating down. Today's Seattle travel tip: If you get the chance, have the Lava Cake. It's amazing. If you're looking for a novel gift to give someone then you could take a look at Cheese Posties. They offer a "cheese toastie subscription service" that sends out regular deliveries of sweet or savoury toasties to the lucky recipient. Word on the street is that they are very nice. As long as you like cheese. And toasties. We're in the finals week of MasterChef, a BBC cooking competition that is taking up more telly time than I'm happy with to be honest. "...and Robert is preparing his signature dish, Sausage and Potato Surprise. He's thrown the potatoes in the oven and now he's playing Mario Kart on his Nintendo Switch......"
We went to the BBC Good Food show today. Great fun. Free samples. And, this year, Black Cheese. It's cheese, but with charcoal in it. And it tastes amazing. The Nibble Nose Cheese Company do some very nice cheeses. I can also recommend their caramelised onion one. I have a number of favourite places in all the world (it saves on the travel). I've now got a new one. Ada's Technical Books. It's a cafe. And a bookshop. And a technical library. And a meeting place. And wonderful. Our apartment is just down the street from the place (you can even see the Space Needle on the walk down 15th Avenue). Ada's become our place of choice for coffee and meals. I'm not saying that I'll travel all the way back to Seattle to go there again. Oh, hang on, yes I would. I've mentioned Thieving Harry's before. The food is great and the ambience is really good too. This was the view from our table today. While we were in Whitby a while back we bought a can of Uncle Joe's Mintballs. They are really really nice. Great to have around when you are writing code. I opened the can today and discovered something a bit naughty. In the "Good Old Days" (tm) you would find a bag of mintballs. Nowadays you have a much smaller number of flashily wrapped, individual mints. The weight of minty goodness you get has gone down from 200 gms to 120 gms. And the price has gone up slightly too. Shame on you Uncle Joe. Shame on you. The Union Shop on the university campus now has a couple of "International" aisles. I found these desserts and picked some up for tea. Rather nice. By this I don't mean that the scones at the Folly Lake Cafe are rock. Just that they are very nice. Serendipity is one of my favourite words. And I only found out about it by accident. Just like I found out about the Folly Lake Café. Now that I'm back on Windows Phone I get Cortana telling me about places to eat nearby, and this place I've never heard of just popped up last week. So on Sunday we thought we'd check it out. My favourite special would definitely be "Bacon, Egg, Burger chips - and salad" Yay! We arrived a bit early to eat, although the food was tempting. The café is located in a dip in the ground that might have been a quarry a while back. Now it is just a haunt for anglers, walkers and cyclists. We didn't walk there, although we might next time. If you are looking for somewhere in the countryside you should go and take a look. I wasn't able to watch much of the live presentation about Windows 10 today. We were down at Fudge having a really nice meal at a bargain price, thanks to their January seat sale (my tip, have the quiche - like a pie but without the lid, and a fantastic filling). Anyhoo, I managed to capture the gist of the event, sneaking peeks of a live blog from the event on my phone in between courses. Which is probably the epitome of bad manners, but I really wanted to find out what was going on. Some perspective here. I'm a Microsoft MVP. I like Microsoft stuff. So you would expect me to say nice things about stuff that comes from Redmond. But even so it was awesome. There was a great balance between stuff that you can see fitting in with your life (universal apps that are built once and run on every platform in an appropriate way, Continuum that makes sure that you get the best experience whatever device you are using, Cortana everywhere, playing Xbox One games on your tablet/phone) and completely bonkers stuff that might just change your life completely (the Holographic headset). I've read up what I can on the headset and the only thing I truly, definitely know about it just right now is that I really, really want one. It is definitely a work in progress. I'm not sure that Microsoft can tell us exactly how they see it being used in the future. But kudos to the company for unveiling it as they did. If you want to watch back the event you can find it here. Microsoft now have compelling hardware, compelling software and real proper science fiction stuff. The next year is going to be very interesting. We had a sort of plan to go to the seaside today. Then we figured that lots of other folks would have that plan too. 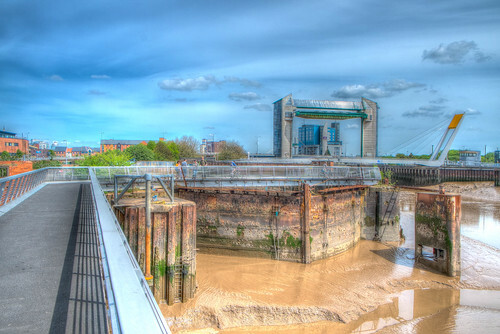 And so we went for a walk around the waterfont at Hull. We went past the deep and round the old town, had a fantastic Beef and Stilton sandwich at McCoy’s and then staggered home to play some silly Table Tennis in the garden. It has come to my attention that I’ve made a terrible error. I’ve been writing posts extoling the virtues of Percy Pig sweets, (which I’ve been buying from Sugar Sugar Sweets – three for two on Wednesday) when it turns out that these are really Porky Pig sweets. 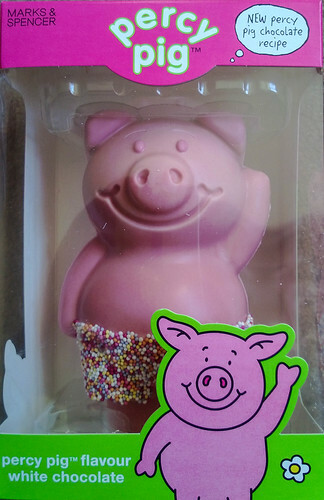 The real Percy Pig is a trademark of Marks and Spencer as you can see above. I found this out when I bought a pig for number one wife for easter. The chocolate tastes great, but we are having a real problem eating Percy, shorts and all as we don’t like saying things like “I’ll have his leg, looks delicious…”. We’ve solved this by convincing ourselves that this is actually a model of Percy, who is alive and well and living happily in a sty in Bournemouth. Oh yes he is. The Hope and Anchor at Blacktoft is a great place to go for a meal by the river. If you are really lucky you might get a sky like this in between courses. And a dirty great boat going past the window (which I failed to rush out and take a picture of). Just make sure that you set your SatNav up with care. My score so far is “Attempts to find the place: 2. Went straight there: 0”. It is also a great place to go if you like Laurel and Hardy. Go along and find out what I mean. And have the roast beef Sunday Lunch. Lovely. 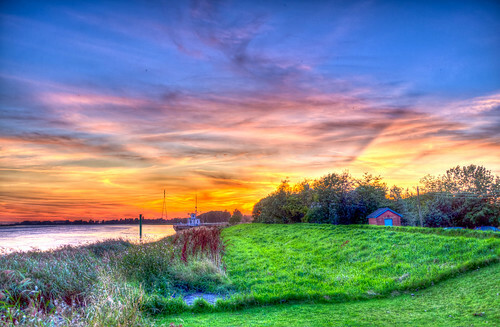 This is another view, using the Painterly 2 filter from PhotoMatix. We sent off our our Imagine Cup Software Development competition entries today. Last day of the submissions, just before the deadline. Well, this is a student competition…. We haven’t sent in any Game Development entries yet, mainly because the deadline isn’t until next year. We had a meeting earlier this week to finalise the entries and get things sorted. As a motivational aid I brought along a tin of Uncle Joe’s Mint Balls. There are a fantastic mint powered confection that have a great flavour and a wonderful inconsistency. Some are just sweet, some have just a hint of mint and some have loads. Very nice, and you can now get them at local stores (previously we used to go to Whitby to buy them). We even noticed last week in London that they had them in Harvey Nichols food hall. Very posh. Anyhoo, I’m not sure if we are going to make the UK finals again this year (the list of finalists comes out early next year) but you never know. Had a wedding anniversary today. Twenty four years of wedded bliss(tm). I bought my wife a romantic novel. She bought me a copy of the ACME Catalogue. We know each other pretty well by now. 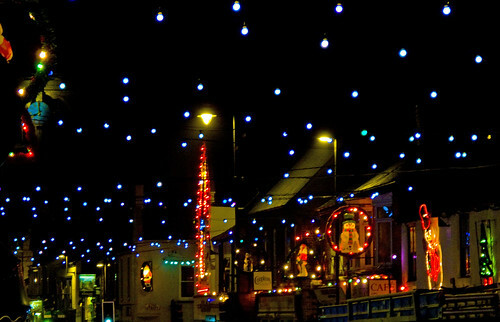 As part of the celebrations we went out for a meal. We went to a place in Cottingham called WokSoEver. You can see a video of it here. As the name implies, it is chinese, and they use a wok for cooking. The first thing we noticed when we walked through the door was the large proportion of chinese guests chowing down. We reckoned that this, and the fact that the place was pretty busy on a Monday night, was a good omen. And so it turned out. The food was wonderful. We had the set banquet for two (there was actually enough for three) and everything was great. I always have difficulty putting names to any kind of dish more complicated than burger and chips, so I've no idea what some of the stuff was called. But the ribs were great, the chicken things on sticks were great and the prawn toast was the best I've ever tasted. The service was attentive and polite, the food was presented with style, and if you get there before half past seven they are presently doing a special deal which gets you a wonderful meal for less than ten quid a head. If you live in this area and you like chinese food (or even if you don't) you should go there. Great place for students to take mum and dad when they visit. They have a lunch time menu too. And they'e won awards.